Skydrop Arc Controller. Image: Skydrop. As the temperatures creep up during the long days of summer, lawns grow thirsty. Even though you might have the best intentions to keep your lawn properly watered and looking lush and green, busy work schedules and family activities can derail you from those plans. The solution is installing one of these 6 best smart irrigation controllers. These devices are designed to replace conventional irrigation controllers, which can be notoriously hard to program. Once in place, they will help keep your lawn at the optimum moisture level and ensure you never again forget to water that expensive sod or yard you’ve worked so long and hard to cultivate. Furthermore, smart controllers can help ensure your garden or landscape bed is kept perfectly watered to grow lush, beautiful plants. These smart controllers are also well-suited for use by homeowners in municipalities where watering is restricted to specific days or times, by delivering easy-to-set systems that put your mind at ease and help avoid potential penalties. Some cities may also offer rebates on smart irrigation controllers, so it pays to check with your local utility. Today, a variety of smart irrigation controllers are on the market that allow you to automate your watering. We’ve done the research and surmised that these six are the best currently available, covering options for in-ground sprinkler systems as well as simple hose-end sprinklers. Rachio offers a complete solution for those wanting smart watering systems for their lawns. Their system for in-ground irrigation setups includes a set of products and an app that works with any smartphone. So, you could purchase a smart sprinkler controller matched to your size of yard, install an optional wireless flow meter, and then download the Rachio app to run it all. 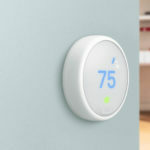 Well connected, Rachio works with Amazon Alexa and Google Assistant, plus integrates with Nest products through Works with Nest integration. The cost of the system varies, depending upon how many zones you need to control. For example, an 8-zone Rachio 3 system with a wireless flow meter will run you around $399. Add-ons include things such as weatherproof outdoor enclosures. Aiming to make hose-end lawn sprinklers and drip watering much smarter, startup AustinDevices created the Zilker smart water valve system. This compact device simply attaches to any outdoor hose bib to help control the flow of water into the garden hose, which would then be attached to your sprinkler or other portable watering device. The way the smart valve works is that it connects to your home’s Wi-Fi network and then taps into the Zilker Cloud to check on weather conditions. With this information, it will decide whether it needs to water your lawn or not. Right now, Zilker is in the final stages of Beta testing but will start selling in late 2018. You can join their mailing list to get updates about when it will be available. Pricing isn’t yet available. Update Spring 2019: The Zilker smart water valve system is now shipping. The production version of Zilker smart water valve. Image: Digitized House Media. You can order direct from the company or from Amazon. Look for an in-depth review of the product soon on Digitized House. RainMachine Touch HD-12. Image: RainMachine. RainMachine is another smart irrigation controller designed to manage in-ground systems with multiple zones. It offers compatibility with Amazon Alexa and Google Assistant, so if you notice a specific zone in your yard that could use some added hydration, you can issue a voice command to water that section. The systems come in at the middle of the cost spectrum among this genre of smart devices. For example, their 12-zone Touch HD-12 model with a color display costs $239, but you’ll also have to consider the cost of an Amazon Echo or Google Home speaker if you want to integrate them. Add-ons, such as rain sensor cable or a 110V AC-AC power adapter, are additional. Orbit offers a smart timer that you can put your in-ground irrigation system on. Their Orbit B-hyve sprinkler timer helps you make decisions based on the needs of the groundcover you chose for your yard. It comes with the ability to control eight zones and control them from your smartphone. You can schedule your watering, but you can also hit a button that reads “rain delay” if you have an unexpected downpour. Orbit is also compatible with Amazon Alexa. Their six-station timer starts at $109.99. Blossom’s smart sprinkling controller for in-ground systems allows you to program a watering schedule for your lawn and prevent overwatering—the Blossom system starts at $149. Blossom can analyze weather reports via a cloud-based algorithm and give you an optimized watering schedule based on your specific location. As with other systems, you can add various accessories onto the base model at additional costs. 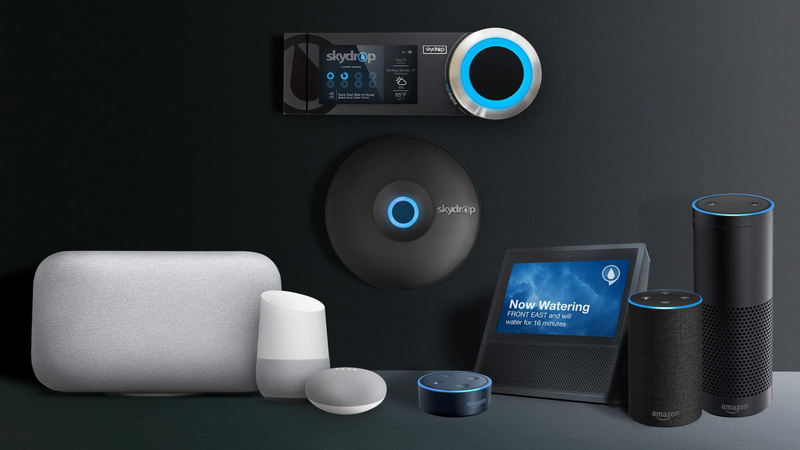 Still, the cost of the base system itself is reasonable for the peace of mind you get, and that includes compatibility with Amazon Alexa and Google Assistant. Skydrop Arc Controller (see image of the system at the top of this page) works well if you have a large yard with an in-ground system and need to manage more zones. The Skydrop Arc allows you to program up to 13 different zones. The company says you could save up to 50 percent on your water bill by using their smart irrigation controller, and the system integrates with Amazon Alexa and all Echo devices. You can set it to customize your watering based on the temperature and precipitation. On top of this, you can designate zones as either yard or garden, and the system will adjust watering based on the ideal conditions for that zone. For in-ground systems, do keep in mind that watering zones are typically defined by the number of underground sprinkler valves built into your system, not by the smart irrigation controller. So, if you have a conventional non-smart irrigation controller with 8 zones, replacing it with a smart controller will only give you 8 zones. Smart irrigation controllers are excellent tools to keep your lawn happy and save you work and worry, while also conserving water and saving money on your water bill. No longer will you have to recall if you remembered to turn on the sprinkler system or turn it back off. In fact, if you forget, you can open an app on your smartphone and see what your smart system has scheduled. Smart irrigation is clearly the wave of the future, and your lawn will thank you for investing in one of these systems now.